Knowledge management is nothing but making available right knowledge to right peoples, in our project this peoples are students. 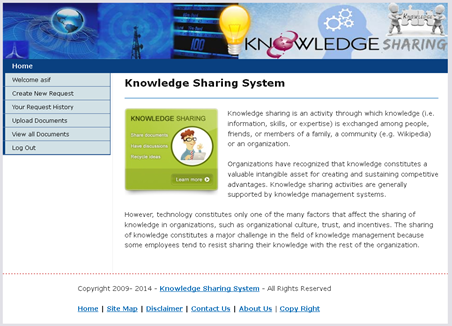 The concept of this project is to share the knowledge among the students and admin using documents. Student can login and download documents which is been uploaded by other students. He can also upload documents (PPTs, PDFs etc) so other students can download it and get benefited. Admin has a role to approve the documents so once any document is get uploaded then it can be approved/disapproved by administrator. I have developed this project using my own Java MVC framework called AqsaMVC. It’s a very simple MVC framework based on xml configuration and used in most of my small java based projects. I have developed it because I don’t want to use Struts 1.x due to some reasons. View all documents, allow, remove documents from list.